At the height of Ireland's Great Famine, Choctaws in southern states of the USA sent a donation of $170 (£111). An extraordinary whip-round, that would be tens of thousands of dollars today. 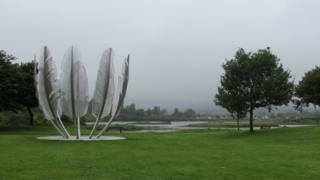 Cork-based artist Alex Pentek told the BBC that the 6m tall feathers, all unique "as a sign of respect" signify the feathers used in Choctaw ceremonies. They are arranged in a circle, making the shape of an empty bowl that symbolises the hunger suffered by Irish people in the famine. A million people died in Ireland and another two million left the country when the potato crop failed for successive years, removing a vegetable that poor people ate every day. The British government, which ruled the whole island at the time, did not offer comprehensive relief help, partly due to an economic doctrine of laissez-faire and partly due to a belief that the famine had been sent from God to improve Ireland, according to Charles Trevelyan, the British administrator in charge of relief. Could thousands have been saved? The Choctaw people empathised with Ireland's famine victims. Just 16 years before, the American government had forcibly removed them from their land, moving them to designated parts of south-east Oklahoma. In what became known as the Trail of Tears, thousands of people walked more than 1,000 miles (1,600km), having been forced to leave without gathering their possessions. Four thousand people died of hunger, cold and disease. Historian Julie Allen told the BBC World Service's Newsday programme: "We had been through so much, losing so many of our people through death because of the weather, starvation and disease that 16 years later we heard about the Famine and the horrible situation that they were going through, we felt such empathy that we wanted to help. "The memory of that has been passed down through oral history and written history to both the Choctaw and the Irish people. "This is just such a blessing to us, that the links between our nations can be strengthened with this sculpture." Mr Pentek said: "While I was trying to put myself in the shoes of the people suffering I realised that some things are just unimaginable, that the level and scale of suffering that both nations had endured was really beyond being able to think about, beyond our grasp." Joe McCarthy of Cork County Council said there was no specific link between Midleton and the donation, but the story had "relevance to every single Irish person born since the famine". The sculpture is made of stainless steel and includes more than 20,000 welds.